Bike lockers provide the best security for cyclists—offering ideal protection against weathering, theft and vandalism. 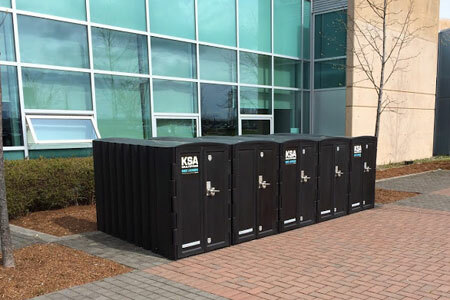 R-8285 Bike Lockers feature heavy-duty plastic construction designed to withstand high impacts and tampering from prying devices and other invasive tools. Encourage integrated communities by supporting a healthy and responsible means of transportation. Bike lockers accommodate any standard-size bicycle, including electric bikes and mopeds. They feature simple, non-intrusive installation, making them easy to install and relocate if needed. Unique, triangle design also ensures lockers can be configured to suit any parking environment. Bike lockers offer spacious and easy-to-access interiors—optimal for storing additional packs, helmets, lights and other accessories. A solid door-locking mechanism requires only a single padlock to ensure fully enclosed and secure storage. The triangular, wedge-shape design is ideal for any outdoor layout. Individual units can be interlocked to create circular or straight-line configurations—perfect for interior and exterior corners, straight walls and open spaces. Made from low-density polyethylene, Reliance Foundry bike lockers resist cracking under stress, have excellent impact properties and will retain their shape and color.